That we tum the old Creamery building over to the Fire Department for a practice drill. Be it resolved to extend the agreement with the Chamber of Commerce and the R.M. of Clanwilliam regarding the airport to the year 2005 A.D.
That it is resolved to request the RCMP supply additional patrols for the village until the present crime wave is stopped. Be it resolved that bylaw No. 357/86 being a bylaw of the Village of Erickson providing for Fire Protection within the R.M. of Clanwilliam be given third reading. Be it resolved that bylaw No. 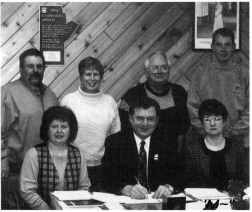 381/87 being a bylaw of the Village of Erickson establishing a Municipal Heritage Committee be given third reading. Apparently community interest was not sufficient to proceed with the log parson­ age as a Heritage Building. Whereas the Manitoba Water Services Board submitted a proposal to the Council of the Village of Erickson in regards to the operation of the Erickson Water Plant. And whereas the Council has agreed to the terms as outlined in the agreement and subsequent letter dated February 1, 1988. Now, therefore, be it resolved that council enter into an agreement and hereby authorize the Mayor and Secretary- Treasurer to sign the agreement and carry out the terms and all other items pertaining to the said agreement. Be it resolved that the Administrator proceed with the purchase of a lot in the Village of Erickson for a Library building and that the Municipal Solicitor draft the appro­ priate agreement. That bylaw No. 400/88 being a bylaw of the Village of Erickson providing for the selling of land for construction of the new hospital.